OC-16 Talks Kauai’s Coral Disease with Terry Lilley Terru Lilley is interviewed on Oc16 television regarding the rapid spread of Kauai’s coral disease outbreak. NOAA Surveys Kauai’s Coral Reefs Tuesday, the First NOAA survey of Kauai’s coral reefs documenting the cyanobacterial white coral disease began at Waipa. NOAA did transect surveys where they laid a tape measure on the reef and counted infected corals. An article written by Terry for Surfer’s Path about Hawaiian Sharks and their history, misconceptions, and behaviors. KHON reports on Terry’s video with surf legend Bill Hamilton and Sava the surfing dog. Click below to see the full story.Sava The Incredible Surfing Dog. 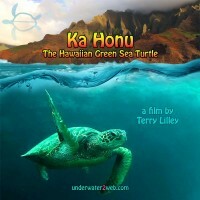 KHON reports on Terry’s efforts to protect and preserve the Reefs of Hanalei Bay. Click below to see the full story Biologist Calls Kauai Reef a Junkyard. KHON reports on a close encounter in Hanalei Bay with Terry explaining shark behavior. Click below to see the full story Close Encounter On Kauai’s North Shore.